British police have referred the death of Georgian tycoon and opposition politician Badri Patarkatsishvili to a crimes investigation unit for scrutiny. They say they are treating the death as "suspicious", but add this is standard procedure with any sudden death. Aides of the 52-year-old, who died on Tuesday in Surrey, say he had a heart attack. Mr Patarkatsishvili was charged with plotting a coup after protests last year, and stood in recent elections. Since being charged, Mr Patarkatsishvili had lived in self-imposed exile in Britain and Israel. The multi-millionaire businessman was one of Georgia's richest and most controversial men, the BBC's security correspondent Gordon Corera says. He was deeply involved in the murky world of Georgian politics and had recently spoken of fears of a plot to murder him. For these reasons, close attention will be paid to the investigation into his death, our correspondent says. However, after an initial examination police experts said there was no trace of any radioactive substance in his body. That may assuage any fears that Britain has seen a repeat of the murder of former Russian KGB agent Alexander Litvinenko in November 2006. "Police were called to an address in Leatherhead in Surrey late yesterday evening (around 2300 GMT) following the collapse and death of a Georgian businessman, Badri Patarkatsishvili who is believed to have been 52," British police said in a statement. "As with all unexpected deaths it is being treated as suspicious. A post-mortem will be held later today [Wednesday] to establish the cause of death," it said. The results of the post-mortem examination were not expected to be conclusive, however, and further toxicology tests will be carried out. Surrey police later confirmed they had referred the death to their Major Crimes Investigations Unit. Mr Patarkatsishvili's former business associate, exiled Russian tycoon Boris Berezovsky, said he had seen him that day. He was not ill but had complained about his heart, he said. "The death of Badri Patarkatsishvili is a terrible tragedy," he said in a statement. "I have lost my closest friend." "This is a huge loss for all of his family and friends." Mr Berezovsky said he would make no further comment on the circumstances of Mr Patarkatsishvili's death until the authorities had completed their investigation. 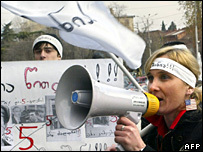 A supporter of the so-called Rose Revolution which brought Mikhail Saakashvili to power in 2004, Mr Patarkatsishvili later turned against the government and began financing opposition parties. The authorities accused him of offering a $100m (£50m) bribe to a senior police official to help him overthrow the government and seize the Georgian interior minister. He denied the charge, saying that he himself was being targeted in an assassination plot. He challenged Mr Saakashvili in presidential elections last month, but could not prevent his re-election. The main opposition tried to distance itself from Mr Patarkatsishvili's self-financed election campaign, and he came third with just 7% of the vote behind their official candidate Levan Gachechiladze. 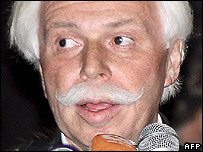 Mr Patarkatsishvili co-owned Georgia's popular Imedi TV station with Rupert Murdoch's News Corporation. Mr Saakashvili pulled the plug on Imedi - the main outlet for opposition views - amid a brief period of emergency rule last November that saw troops tear-gas protesters in Tbilisi. The tycoon made his fortune in Russia after the fall of the Soviet Union in 1991.